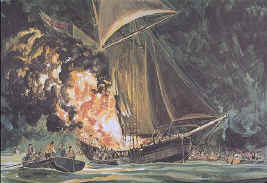 History:American Revolution attack English ship Gaspee. Read the history of the American's raid on the English Navy ship. Read the identities and facts about each Raider. In the war of independence ---- the American attack on the English Navy's ship Gaspee was the first planned use of force against the English military forces. Joseph Bucklin shot with the intention of killing the captain of the English Navy's ship Gaspee. The 1772 Gaspee Affair --- the Rhode Island men's attack on the Gaspee --- was officially declared by the English Attorney General as an act of war by the Americans. For the English government this was the official start of the American Revolutionary War. England began assembling warships and an army to send to New England. The Gaspee Attack. Read the fascinating story of the resourceful Americans attacking the English navy ship Gaspee; the background, the reasons for the Rhode Island attack, and the English reactions to the attack, including the King's Royal Commission to bring the attackers to England for trial as traitors. That move by the King alarmed the other colonies and lead to the colonies' unified resistance to England. The Gaspee Attack. The Gaspee Raiders. Read the list and biographical information of the men (including Joseph Bucklin) who attacked the Gaspee. Read who these men were, and the events in their lives before and after the attack. Immediately after the Gaspee attack, when the English sought to find and hang these men as traitors had committed an act of war against England, a conspiracy in 'Rhode Island hid their names and identities. Ten years after the Gaspee attack, after the formal Treaty of Paris, was the first time that their names could be disclosed. As the pre-war generation died, and the post-war generation turned to the great events of building a United States, the names of the Gaspee Raiders were not recorded. By then the Gaspee attack was old news, paling in comparison to the great battles of the Revolutionary War. Their names became unknown by the end of the 19th century. Now, original research by Leonard Bucklin of the Joseph Bucklin Society, and by others of the round table group known as the Gaspee Scholars, has produced major additions to the list of men who gathered together, and undertook the first planned act of war in the American Revolution. The Raiders List. The First Shot of the Revolution! It was after midnight on June 10, 1772. There was no useful moonlight and dark cloaked the Narragansett Bay, where the Gaspee, an English Navy schooner, had run aground on Namquid Point. Yet there was enough light so that Joseph Bucklin could see the Gaspee's commander on the starboard gunwale, swinging his sword and preventing the American attackers from boarding the English schooner. "Ephe," Bucklin said to his friend Ephraim Bowen, "reach me your gun, and I can kill that fellow.". . .Read the full story. About the Joseph Bucklin Society. The Rhode Island attack on the English Navy ship Gaspee was a significant event in the history of the American Colonial Revolution and the start of the American Revolutionary War, This national history site for the Gaspee attack is part of the Joseph Bucklin Society's research and educational efforts. The Joseph Bucklin Society is dedicated both to researching and preserving the history of the Massachusetts and Rhode Island colonists and the descendants of William Bucklin, and also transmitting their example of courage, vitality, faith, duty, and honor. Search for Gaspee Affair or Bucklin Family information on all our websites. © Copyrights, 2005 through 2009, Leonard H. Bucklin.